Decamping to Brighton is de rigueur in British summer time. Kitsch, confident and cool, this town has everything you could possibly want from a day at the seaside. On a sunny day, the pebble beach is a merry jumble of splashing swimmers, windy picnics, lively ball games and stripy deckchairs. 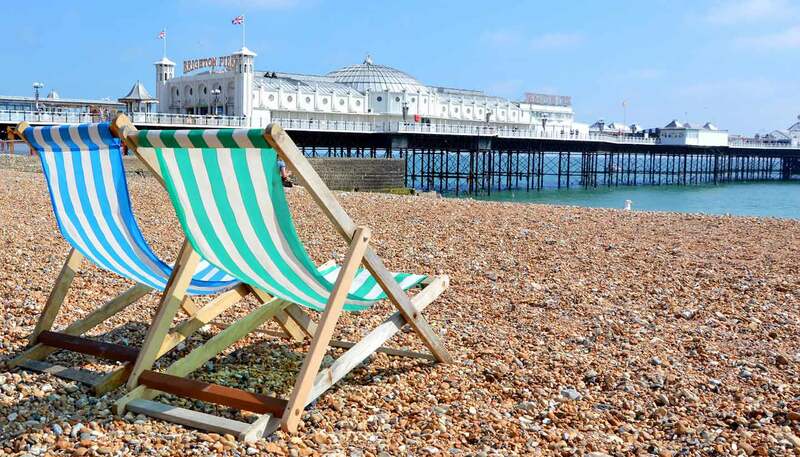 Jutting out into the water and laden with colourful confectionery, flashing arcade games and classic fairground rides, Brighton Pier is one of the city’s most recognisable icons. The extravagant Royal Pavilion, built to satisfy the whims of King George IV, is Brighton’s other big name attraction. But beyond this gaudy slice of Georgian architecture you’ll find a modern city centred around Jubilee Square. Here you’ll find an impressive library, top notch restaurants and plenty of room for some serious people watching. The boho vibe of North Laine and South Lanes is not to be missed either. Shop for vintage clothes, flick through crates of second–hand vinyl, stock up on vegan treats or duck into a pub for a pint of Harvey’s Sussex Ale. Brighton has a well-earned reputation for its gay-friendly scene too, especially in Kemptown. The summer and winter pride events attract huge crowds from all across the UK. There’s a strong cultural streak here too, with heavyweight acts always passing through the ace Brighton Centre and cutting edge bands and DJs playing at venues such as Komedia. The Great Escape music festival sees the city taken over by independent artists for a weekend in May, turning Brighton into the hippest place in the UK. If all that partying gets too much, remember the rolling South Downs National Park is just a short drive or train ride away. And if you don’t fancy a dip in the sea, the soon-to-be-reopened art deco Saltdean Lido will be a great way to soak your bones on a hot day.